Proper seating and positioning is critical for people using wheelchairs and powerchairs. Sitting all day is hard work – generally the main concern for long-term wheelchair users. If you’re an able-bodied caregiver, however, you may not have given it much thought. Just consider how stiff and exhausted you are after a long car journey. Our range of wheelchair seating solutions are designed to promote good posture, skin integrity, relieve pressure and maximise your full potential. 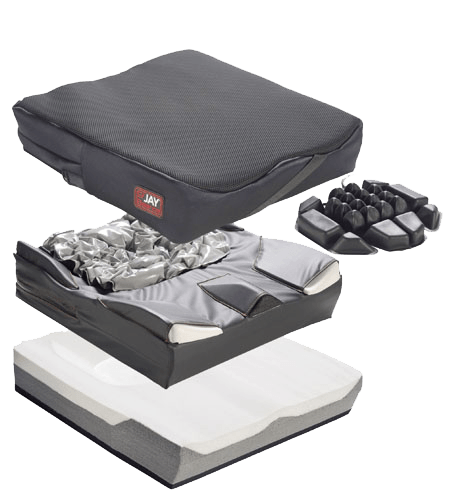 Brands such as the Jay Cushion range are comfortable, lightweight and low maintenance and are designed to suit a wide range of wheelchairs and powerchairs. Designed for pressure relief, stability & positioning. Positioning the user can be frustrating. You position the user in the wheelchair, and in no time they start sliding, slouching or leaning. You readjust the user, who again returns into the same unnatural and uncomfortable position. You may have used pads to discourage this behaviour but nothing seems to work! Unfortunately, efforts to help by restricting movement tend to be misguided. Caregivers often spend time trying to control the user, whereas they should really be focusing on the wheelchair. More often than not, there’s something wrong with the wheelchair, and discomfort or pain pushes the user to try and escape the uncomfortable position. Our team of Wheelchair and Seating Specialists are trained to handle the unique seating requirements of long-term wheelchairs users. 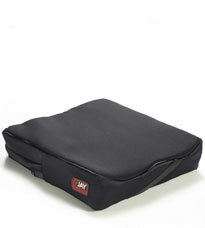 We don’t just sell wheelchair cushions; we sell solutions for problems. Every cushion, back and headrest comes with a free home assessment, which allows our specialists to make sure the user is getting the right solution to meet their needs. If you would like to book a free home assessment, please fill in our contact form and a seating specialist will get back to you as soon as possible.